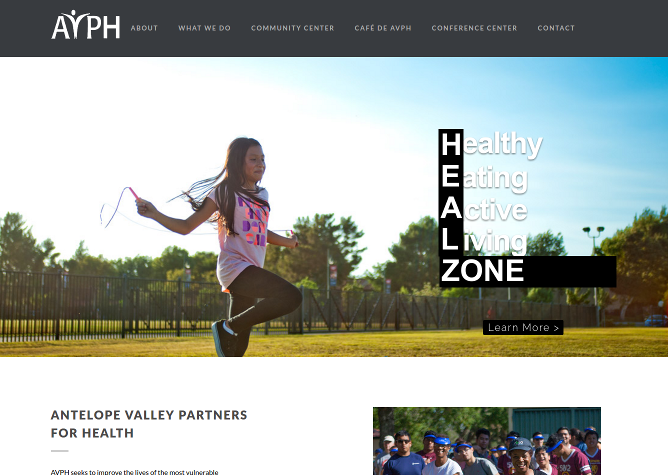 Antelope Valley Partners for Health is a non-profit in southern California that provides outreach and policy planning in the northern end of Los Angeles county, where the population is predominantly lower-income and minorities. They work particularly closely with new families, nutritional and fitness counseling, and school policy implementations to improve the quality of life for people in that region. They needed their website rebuilt and updated, and it had to be done in 3 weeks or less. Challenge accepted! 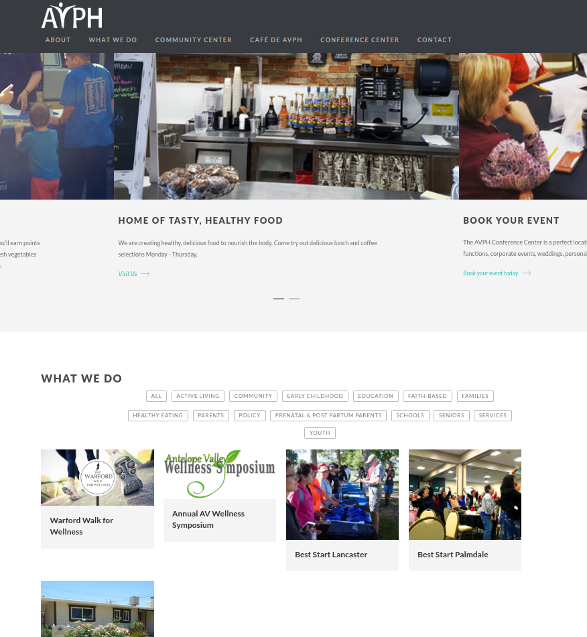 Coming into this project, they had already selected a theme (Peak, a theme for non-profits) and had the hosting already configured. The content was loosely defined but needed to be re-organized to reflect the organizational re-structuring they were undergoing at the same time. There was also a significant lack of visual assets in the provided content. I worked with my liaison from their organization. Together, we looked through some photographs of events that she had shot (she’s a trained photographer) and her work was high enough resolution and well-suited for use with this site. We also determined what content needed to be spotlighted and where it should go. The theme is pretty heavy in terms of how much it overrides default wordpress behavior – creating a page.php template did not specifically get seen, so we had to play by the rules and work within the system that it created. Fortunately, the “Campaigns” feature was suitable for showcasing their programs, and had some nice UX sugar to go with it. I modified some minor theme assets and wrote a whole mess of CSS to tweak the display to reflect what they wanted. 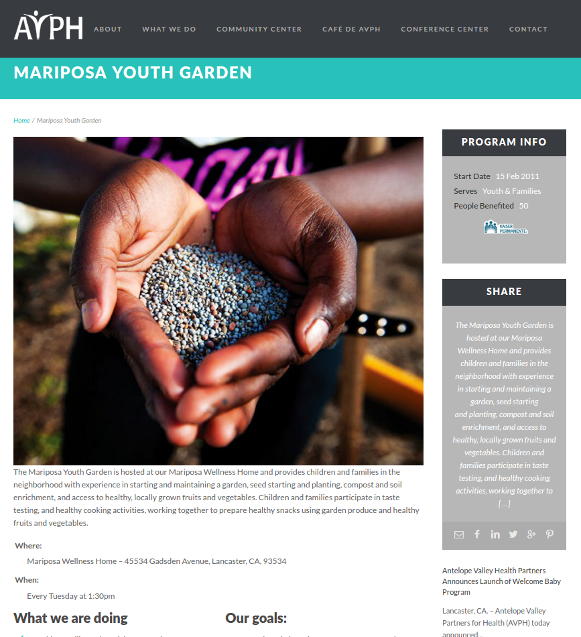 To encourage engagement and outreach, we created custom contact forms that displayed at the bottom of most pages. These contact forms were preset to route to the appropriate recipient. 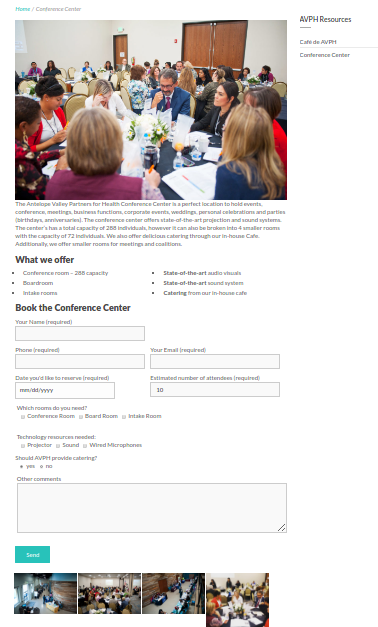 The contact form for the conference center asked additional questions that would facilitate booking the venue for an event. Finally, I created some slides with the slider, the very customizable Revolution Slider plugin. This involved identifying strong photos that promoted the image that AVPH was trying to depict, and I wrote some marketing taglines for each of them. Just to make things look extra shiny, I used the slider’s animation tools to really sauce them up a bit.